When Lars worked for Mosel Wine Merchant, he once reported on O.W. Loeb and Terrence Prittie’s Moselle. That report triggered me to buy the book, and then I caught the Mosel wine history bug. Interestingly enough, Loeb and Prittie do not mention their fellow-wine merchant H.R. 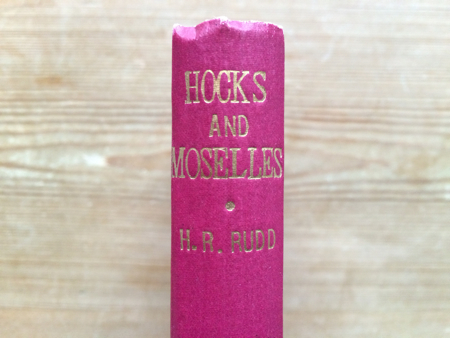 Rudd’s book, Hocks and Moselles, which was published in 1935. I actually learned about it through the Swedish wine author Lennart Thölén’s book on the Mosel from 1962. Rudd’s book was a volume in a series of the Constable's Wine Library, aimed at “providing the contemporary wine-lover with exactly the facts about his favourite wines which will help him personally to appreciate and enjoy them and guide him in offering them to his friends.” In the foreword, Rudd wrote that he was reluctant to write about his favorite subject—he would rather have talked about it. Eventually, the editor of the series, André Simon, convinced him to set it down on paper. Rudd was the only non-professional writer of the Constable's; the others were lawyers, journalists, or authors. Hugh Randall Rudd was born in 1882, in Norwich, where his grandfather had established a wine merchant business back in 1851. Just after 1900, Rudd was sent to a small village near the Rhine Valley to learn German. He learned the language, but also developed a fondness for German wine. Upon his return to England, he worked in the family business till the outbreak of World War I, when he joined the army and eventually reached the rank of major. After the war, Rudd settled in London and joined the old, prestigious wine merchant Berry Bros. & Co. as a junior partner. (Today, the firm is called Berry Bros. & Rudd, and his descendants are still part-owners.) Despite his active participation in the war, Rudd made visits to Germany as soon Europe had won back its peace. In his book, he raves about the 1921 vintage of which he tasted many different bottles. Rudd died in 1949 in the village of Eton, just west of London. As the name of his book implies, it covers the Rheingau, Nahe, Rheinhessen, Pfalz, and Mosel (see also "Mosel or Moselle?"). Attached to the book is a foldout map. Just like Karl Heinrich Koch's Moselwein, Rudd takes a travelogue approach and pairs his narrative with selected anecdotes from his many visits to the region. The Nahe wines are light and harmonious but not quite so full bodied or full flavoured as those of the Rhine; in fact, on many occasions they are to me reminiscent of the Moselle, especially when produced entirely from Riesling grapes [back then less than 50 percent of the growing area]. One can say, therefore, with a good deal of truth that they are somewhat of a type standing midway between those of the Rhine and their kindred of the Moselle. It has been charged against Saar wines that many of them are Saar by name and sour by nature. There is a certain element of truth in this contention; they are not always of a type which appeals to the English taste. In an ordinary year they can be thin, steely, hard and unsympathetic, but German connoisseurs delight in these characteristics. In a bad year they can be too much of the good thing, even for German palates, but in a fine year there is nothing better, more delicious nor racier than the beautiful wines of the Saar Valley, with their natural bloom and fragrance. Photo of the book's spine. Thank you for taking the time to review this book. I’ve been enjoying your contributions to Lars’ site. Hello Andrew, many thanks for your kind words. Gilberto, glad that you liked it and bonne lecture! I recently bought the volume on Burgundy, by the Irish journalist and poet Stephen Gwynn, which I still have to finish.